Florence, the fifth oldest town in Arizona, has a past rivaling that of many a hell-raising, wide open Western boom town where saloons and gambling halls were the most numerous and profitable enterprises on the busy Main Street. The town originated quite differently, starting out as a sleepy farming community where the prehistoric Ho Ho Kam Indian irrigation systems were incorporated into a new network of canals that brought the life-giving waters of the Gila River to the farms and homes of the first hardy settlers who took up land near the river in the mid 1860s. This first group adopted and adapted the building techniques of the Indians who built the imposing Casa Grande ("Big House"), the ruins of which still stand on the desert some ten miles west of Florence. Walls and floors of the new homes in Florence were made of adobe mud. Logs and other vegetative matter were used to support the roof, which was simply an added layer of dirt. Many of the early adobe homes and commercial building still stand. One of these, the adobe Chapel of the Gila was the first church in the Territory built south of the Gila River. Following the discovery of very rich silver deposits North and East of Florence, the town underwent a radical metamorphosis, evolving from the small farming community into a typical mining boomtown. Ultimately, 28 saloons were in operation to accommodate the off-duty miners, their pockets jingling with money to be spent on the various entertainment offered. Gambling and feminine companionship were available, along with the liquor that flowed freely. Gunfights and other forms of violence were common for a time. Sheriffs were hard pressed to keep the peace and accepted the help of the local "Vigilance Committee." That group "assisted" in one case by hanging two miscreants in the county jail, now McFarland Historical State Park at the North end of Main Street. Mining money later financed buildings of red brick. Several brickyards began turning out materials for construction of better homes and commercial establishments. 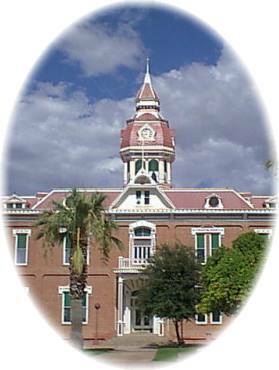 This gave the town a more prosperous, permanent character as seen in the Brunenkant Bakery and the 1891 Second Pinal County Court House. As you walk through the town, carry in your mind the picture of earlier days when green cottonwood and chinaberry trees grew along both sides of the streets, watered by the canals running through the town. You may hear a faint echo of the jingle of coins being wagered at the gambling tables, and the laughter of those painted ladies, eager to share in this new wealth. Occasionally, you may have to duck around an adobe corner for protection when you hear shots ring out as one more argument over a gambling loss of the favors of a lady escalates to final confrontation. Despite its earlier period of violence, Florence is today one of the safest towns in Arizona. Our town welcomes all visitors, whether you drop by for a day or a weekend. To all who pass this way, the door to Florence friendship is always open. We hope you'll step back in time and enjoy our history. The Historic Coke Ovens, otherwise known as charcoal kilns, and listed on the National Register of Historic Places, were built in 1882 along the Gila River by the Pinal Consolidated Mining Company, and are so inaccessible that their preservation is easily understood.